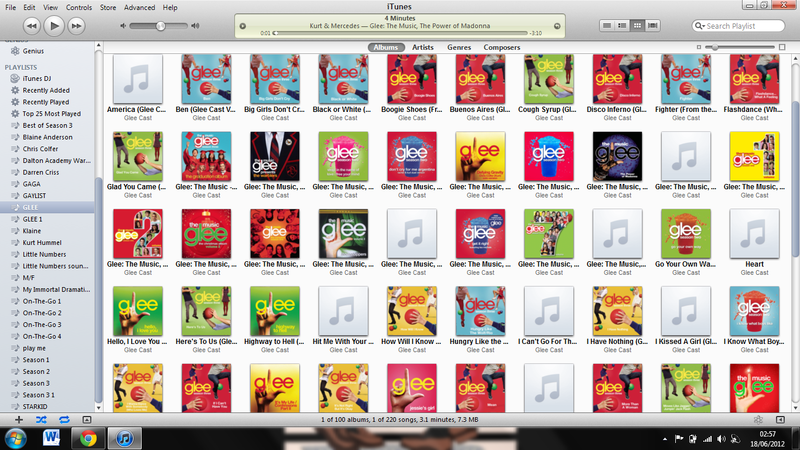 Sometimes, Glee gets everything right. "Funeral" had everything we loved, and it even threw in some things that we didn't even know we wanted. There were moments that moved me to tears, numbers that got me doing a dance in my chair, and storylines that changed the fates for some of our favorite couples. Tonight, Glee definitely got it right. So, let's go back and reminisce about one of the best episodes of the season, plus start the countdown to the season two finale! Jesse St. James Is Boss: Jonathan Groff was featured much more prominently in this episode, and it was awful to watch. And by that I mean that so much flawless perfection hurts my eyes. But the pain was worth it to have Jesse not only bringing back auditions to find New Directions' star (more on that process down below), but it also meant some awesome friction between Finn and Rachel. And as my Finchel fans know, friction = feelings. Plus, it was nice to see Rachel worrying about being a star again, and I think Jesse played a huge part in that. Jane Lynch Secures Another Emmy Nomination: I've known for awhile that it would be Sue's sister dying in this episode, but it still didn't prepare me for Jane Lynch's positively killer performance. She was her usual over-the-top evil self, which always brings a laugh, but the moments where she admitted to being lost and unable to deal…that's where Jane really shined. Telling Will that Becky was off the cheerleading team because she reminded Sue of her recently departed sister started the awesome-acting train, and it never slowed down. The scene with Finn (Cory Monteith) and Kurt (Chris Colfer) helping Sue clean up her sister's room was positively heartbreaking. The entire episode Sue straddled the line between "pretending to be fine" and "overcompensating for the pain" and Jane nailed every last moment of screen time. I'm currently driving over to her house to help her pick out an Emmy dress. We're going with robin's egg blue this year. Also, I seriously cannot not talk enough about how much I loved the trio of Kurt, Finn and Sue. Magnificent. The Willy Wonka setup? I can't. I just can't. Auditions Are Always Fun: I am so in love with the fact they brought back auditions for this episode. Even though it was for a starring role in a Nationals number, it was a great callback to the pilot. Rachel (Lea Michele) putting that star next to her name put a smile next to my heart. I love remembering the wonderful parts of season one. We got great numbers from the New Directions members, plus Jesse was there to be awesomely nasty. What an explosion of Glee fun! Seriously, it's all over my TV screen. Especially when Mercedes (Amber Riley) stalked offstage dragging the microphone behind her. Will's Future As Glee Leader Is Uncertain: Well done, Mr. Schuester. I'd also employ the woman with OCD to help me pack. Of course he probably had other reasons enlisting Emma (Jayma Mays) as organizer. Because who else would help him sort out his vests and his feelings on chasing his Broadway dreams? The vest thing was a nice touch, since we got a sweet Will (Matthew Morrison) and Emma moment while they reminisced about the first time they met. The whole packing scene was the perfect setup for Will's trip to New York with his team, but his whole "I'll be back by the end of the summer" spiel reminded me of when teenagers in horror movies say, "I'll be right back." That never ends up well for anyone. Don't leave us, Mr. Schue! Rachel Didn't Sing "My Man" for Finn: Yeah, right. And I think Lea Michele has a terrible voice. Please, people. We didn't need the slow-motion shot of Finn (who else thought that was oddly funny?) to know that Rachel was singing that song for her man. Lea owned that number, which was no surprise, but I also loved that Jesse was expecting her to serenade him. I bet you think this song is about you, Jesse. Too bad it's not. But then he was the one to smooch her in the end, so I guess he wins. For now. So Close, Yet So Far Away: Quinn (Dianna Agron) got what was coming to her in the form of Finn finally admitting that he can't fix them and that he wants to break up. But, in the last moments of the episode, Quinn reveals that she has "big plans" for Finn in New York. So close to being done with Finn and Quinn! And so close to Finn bringing a flower to Rachel! Jesse swoops in yet again. And Will making amends with Terri before she moved to Miami meant he's wide open for some Emma love…too bad Emma pretty much kissed him goodbye by, um, kissing him goodbye and rooting for him to stay in New York. Speaking of New York, despite Jesse's "expert" advice, Mr. Schue decides to stick with group numbers and original songs for Nationals. Good choice, you curly-haired hunk of dancing man meat. Nationals is going to be awesome. One of the Most Touching TV Funerals Ever: Jean's funeral was one giant sobfest for me. Why? Only all of this: "I miss my sister. Every night at 10 or so she used to call me on the phone and when I asked her why, she'd tell me that her body told her she wanted to hear my voice." Will coming up to help Sue finish the speech when she couldn't get through without breaking down. "When you love someone liked I loved her, they're a part of you." The faces of the glee club members as they listen to Sue's words. "I remember a life led with no enemies, no resentments and no regrets." Will's tears and his arm on Sue's shoulder. Sue mouthing "thank you" to the glee club after they sang Jean's favorite song. "I love you, Jeanie. Rest in peace." After the tears were cried and Sue was back making her smoothie, she let Becky back on the Cheerios as next year's captain and she resolved to stop torturing glee club. Rewind Moment: The entire "Pure Imagination" number. Because one crying fit wasn't enough for me.